Chris as born on August 17, 1880 in Factoryville, PA. Christy’s baseball career spanned over 27 years. Christy began pitching at the age 13 for his hometown team in Factoryville. He earned his first money playing baseball for Mill City, PA in 1895. He entered Keystone Academy in 1895, where he played baseball for the college. After graduating in 1898, he continued his education at Bucknell University, where he made a name for himself in football as well as baseball. Christy signed a contract to play with Taunton, Massachusetts, of the New England League of $90. per month in 1898. The next year, Christy signed a contract with the Southern League’s Norfolk, Virginia team in October of 1899. The following year he became a member of the New York Giants of the National Baseball League. Christy won 20 games as a 21-year-old New York Giant rookie. His most famous trick pitch was the “Fadeaway.” In 1905, he shut out the Philadelphia Athletics three times within one week during the World Series, scoring his greatest baseball triumph. In 1908, he beat all previous records for endurance by pitching 425 innings, winning 37 games and only losing 11. Christy helped the Giants win five National League Pennants and was in the World Series in 1911, 1912 and 1913, as well as the championship year of 1905. He pitched 16 seasons for the Giants. Christy holds the record for most consecutive innings pitched (68) without walking a baser; he pitched two no hitters-one against St. Louis in 1901 and another against Chicago in 1905. He pitched 83 shutouts in his career. Christy also ranks in the top ten of the all-time strikeout list. At the time of his retirement, Christy held or shared parts of 57 individual, club and league records. Mathewson’s marks in the record books continue to this day. On his retirement in 1916, Christy began managing the Cincinnati Reds. On August 28, 1918, he left to serve his country in World War I as a captain of the Western Front, where he was hit by a whiff of poison gas. 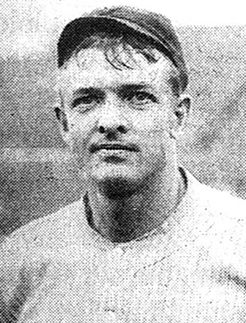 Upon his return from the war, Christy coached the New York Giants from 1919 through 1921. In 1922, Christy became president of the Boston Braves until his untimely death from tuberculosis in both lungs on October 7, 1925. Mathewson was inducted posthumously to baseball’s inaugural class of the Hall of Fame in 1936, with 205 votes of 226 ballots cast (90.71%). Today there is a permanent exhibit dedicating to Christy Mathewson at Keystone College in LaPlume, PA.